Traditional wood kitchens don’t get much more flawless than the Cornell Classic. This aesthetically perfect and incredibly stylish shaker kitchen design utilises the space for your kitchen to create seemingly endless storage opportunities and an absolutely wonderful space for the heart of your home. The Cornell Classic traditional wood kitchen is a beautifully designed shaker kitchen, which maximises your space and ensures there are plenty of opportunities to store all of your kitchen goods and accessories. In a beautiful off-white shade, the Cornell Classic is a gorgeous neutral kitchen which creates the perfect foundation for a colour palette of your choosing. It works well with other neutral shades, or can be complemented with a pop of colour too. Whatever your interior design style or preference, you can choose from 27 matte colour shades to incorporate into your Cornell Classic traditional wood kitchen design. Not only do you have the flexibility to choose the colours for your cupboards, but you can pick from a choice of worktop options. Whether you want to choose something dark and bold to contrast your classic neutral kitchen, or an equally similar shade for a flawless and seamless finish. Special features of this kitchen include a beautiful belfast sink, a plate rack which has an extremely generous storage capacity and curved glass feature doors. Also featuring in the Cornell Classic is a stunning kitchen island, which not only increases the storage options, but also creates a phenomenal surface area for entertaining and preparing your meals. Number One Kitchens are the premium kitchen provider in Manchester, specialising in beautiful kitchen designs and helping you to implement them seamlessly into your home. 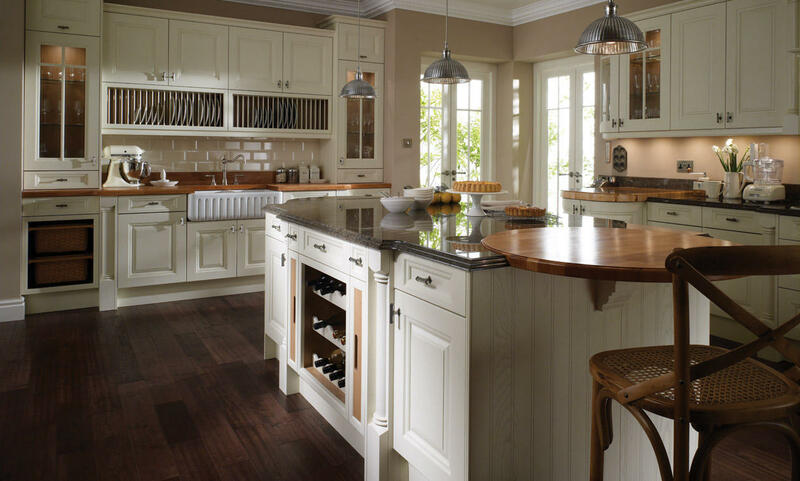 To get started with your Cornell Classic traditional wood kitchen, simply give us a call on 01706 640 395 for a quote and to learn how we can help you transform your home today.